These underground toilets in St Giles’ were built in 1895. They were for gentlemen only, as there was no question in Victorian times of building an outdoor public convenience for women. DISCOVERY OF RELICS.— During the excavation which has been made in connection with the new underground public convenience in St. Giles's the workmen came upon a large quantity of bones and horns, apparently those of oxen and deer, at a depth of about 7ft., a pair of horns being in excellent preservation; they also found a stoneware jug, minus the handle and broken at the spout, and two small cups made of red pottery and glazed, both much damaged. An underground convenience has been built near the southern end of St. Giles-street, containing two w.c.’s and four urinals. These are reached by a flight of York stone steps from the surface of the street, and the structure is surrounded by a strong cast-iron railing on York stone base. The fittings are in the best white glazed ware, and the whole of the brickwork is lined internally with white and buff glazed bricks, the floor being of vitrified tiles laid upon concrete. The convenience is roofed with cement concrete carried upon steel girders, with pavement lights, cast-iron ventilators, &c.
There was originally just one entrance (the present southern one), and the railings surrounding are inscribed with the name of their maker, LUCY & CO, OXFORD (right) A second entrance with matching railings was built at a later date. 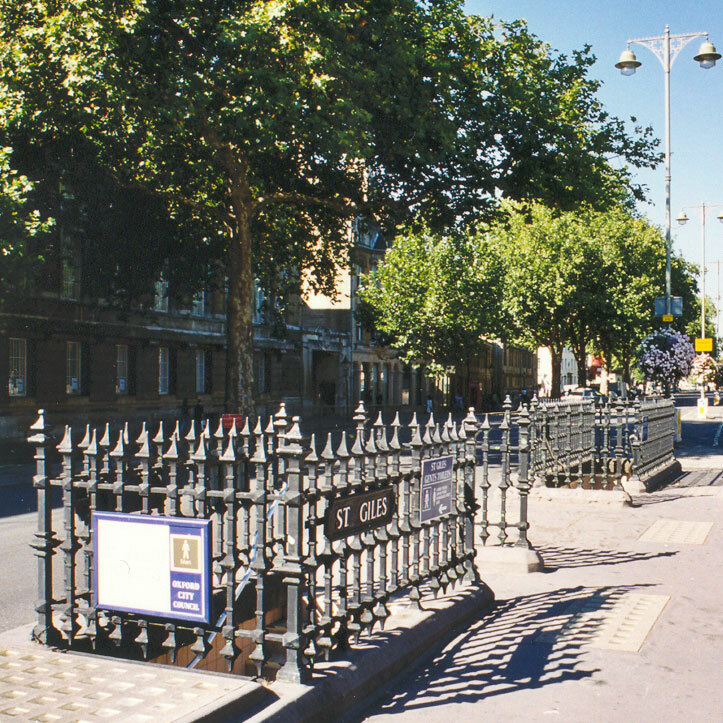 This image from GoogleMaps shows how these fine railings lead the eye down to the Grade I listed Martyrs' Memorial. The postcard below (postmarked 1920) shows just the original entrance and railings, with the cabmen's shelter parked behind. Doubtless the cabmen found this new facility very useful. In 1985 the toilets underwent a £47,000 renovation and concrete skylights were installed. In 1998 the city council installed new stainless steel cisterns, toilet pans, and cubicle doors. There were no public toilets for women in the country in the nineteenth century, and even in London there was outrage in 1900 when proposals were put forward for a ladies’ toilet in Camden Town. A very different “novelty” that our Department inaugurated was Sanitary Conveniences for Women. Strange to say, such comforts were open to men, but women were too modest to mention such a need. George Bernard Shaw wrote a pamphlet on this much-required service and about that time Oxford City Council decided to supply the need. 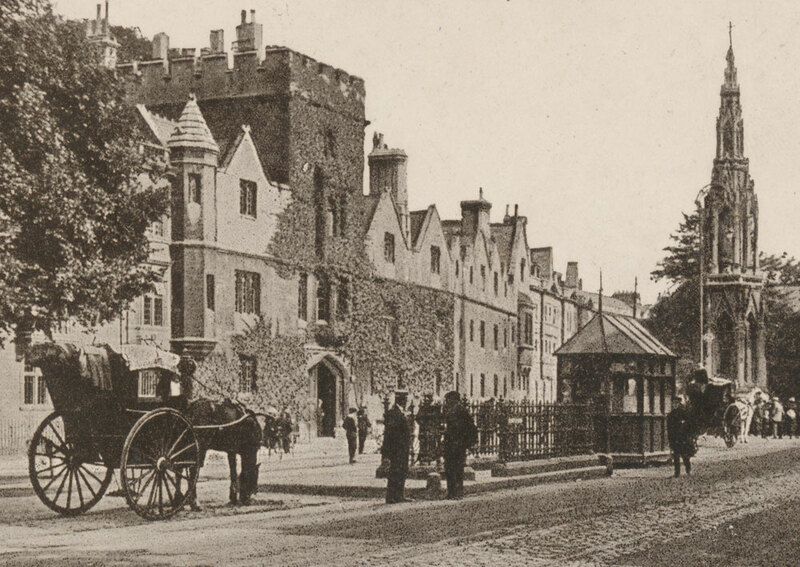 Quite an agitation arose when it was announced that the first unmentionable contrivance was to be put, mercifully below ground, under the windows (the side windows) of Balliol. Even one of my sisters, visiting me and being shown with pride my latest boast, turned-away with disgust and called my work “indecent”. This toilet remains open in 2018. In February 2014 they were put up for sale with a guide price of £65,000, and they were bought by Harries-Jones Ltd (the business of Gwyn Harries-Jones, the owner of the Galaxie Hotel in the Banbury Road). The offices were, however, never built, although some work on the site started on 21 September 2017. The owner of the site Harries-Jones Limited acquired the toilets in 2014 and subsequently secured planning approval for the use of the site as offices. After a period of reflection the client has decided that in order to make the development of the site economically viable alternative uses for the site needed to be considered. The client is a small local family business that specialises in boutique bed and breakfast and short-let accommodation in Oxford including Henry's on St Michael's Street and The Galaxie Hotel in Summertown. The facility will add quality and choice as short let accommodation providing a unique opportunity for visitors in Oxford, with the client well-placed to understand and respond to the market to make a successful venture. The proposal included two glass structures above ground, and a plant room to supply clean air to the bedrooms.